For the price, J&R delivers what amounts to an average choice grade steak. The sad part is that the steak here can sometimes taste as good or better than some of the places charging lots of money for a prime cut. I had the broiled ribeye here because in the past I have had the marinated ribeye. I almost went with a filet, but changed my mind last minute. This is the kind of place where a marinated steak is a wise selection, because the process imparts tenderness and flavor into the less-than-best cuts of beef. I enjoyed it for what it was: a cheap, local joint where I could chow on a half decent steak. The meat was cooked much more evenly and correctly as opposed to Islip, so I bumped the score up a point here. This is essentially going to be the same as my earlier review of J&R in Islip, since they have the same menu and cuts available. Nothing has changed here either from the previous J&R review of the Islip location. One thing I will mention is that I didn’t think my steak was actually 24oz. I realize that several ounces cook away in the process, and that steaks are weighed before cooking, but this boneless cut seemed more like an 18oz-20oz cut to my eyes. Again same as J&R in Islip. 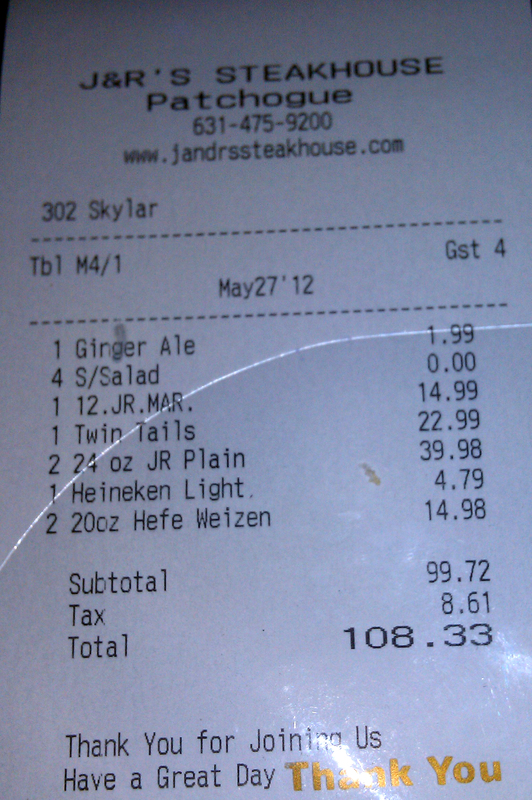 The bill for four meals was $108. Half the price of Murtha’s and a quarter the price of the big boys in NYC. I’ve raised the bar score for the Patchogue location by a point, because it is a nice long stretch of real estate with a great selection of beers and specials. It is also across the street from a great fun pub called the Brickhouse Brewery. See the J&R Islip review again for this section – it remains unchanged. J&R steaks come with a soup/salad and a side. I had a salad with blue cheese – nothing fancy, but it did the job. 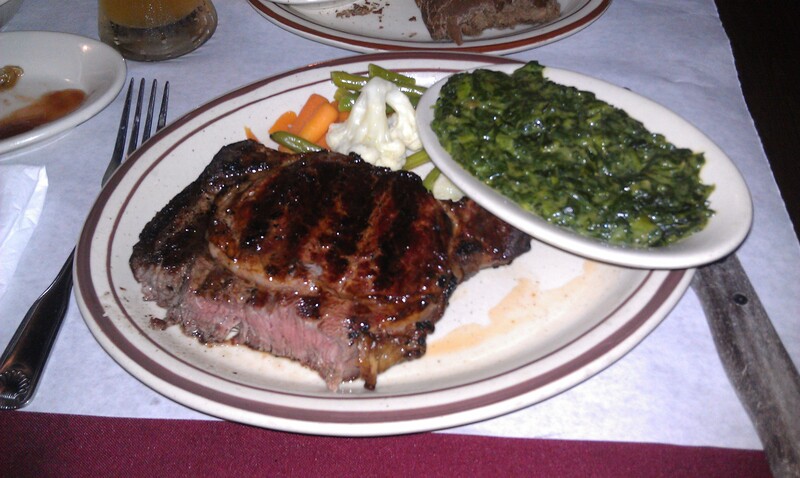 For my side I picked the creamed spinach, which was creamy but lacked character. The steak dinners also come with a little bit of steamed veggies on the plate (cauliflower, carrots, and beans). We skipped apps and desserts. J&R seemingly has a lot to choose from aside from clams and oysters. My wife had twin lobster tails, but they were EXTREMELY salty… like RUINED. Total suckage, because she could barely eat her meal. Her baked potato was the best part of the meal, she said. In hindsight we should have sent it back. I took two points here from the earlier review score for that major blunder. Our waitress was nice – she even offered up an Italian ice place for us to grab dessert when she heard us talking about going on the hunt for ice cream. This J&R is much nicer than the Islip one in terms of bar, so that kinda overtakes the score on ambiance as well.